Home » Which celeb do you resemble? Which celeb do you resemble? Bonnie Shucha made my day, helping me discover my hitherto unrealized resemblence to Mel Gibson. 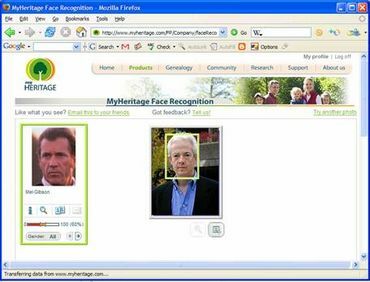 Her recent post alerted me to MyHeritage.com’s face recognition tool. The idea of the tool is to allow uploads of multiple family photos without having to identify each person in each photo manually. The demo version matches the face in the photo you upload to that of a celebrity. Given the results pictured here, I would have to conclude its accuracy is questionable.